It’s almost time for lovers, admirers, and the lovelorn all around the world to own this one day of the year meant only for the matters of the heart. Here are some gift ideas from the Styling Sistas desk that will make the intended receiver swoon and will not break the giver’s wallet. The featured gifts are under USD100! Swarovski sure has made an impressive name in the market, a name that sounds expensive in itself. However, Amri (pictured below) has received some pretty shiny crystals from her chronically underpaid and love-struck lover. These were special edition items that are unquestionably cherish-able and evergreen or everred, may we say! 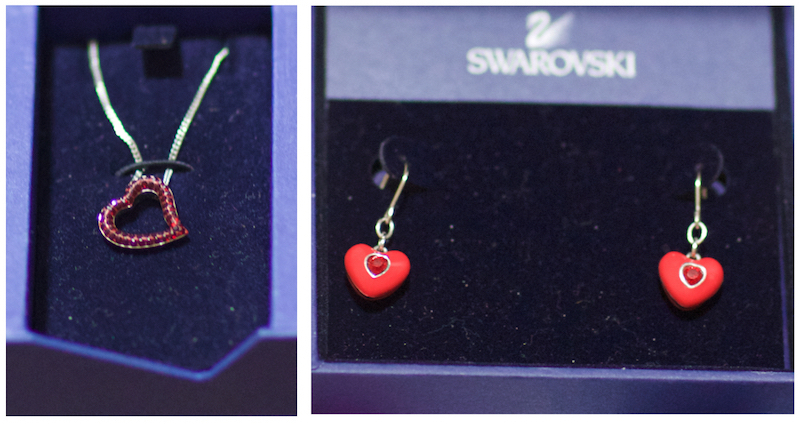 These particular items are not available currently, however, the Valentine’s Collection and Gifts of Love at Sworovski has similarly affordable and beautiful choices like the ones picked by Stylingsistas here. Swarovski Elements Crystal collections available via Amazon has even cheaper options like these beautiful heart shaped faux gemstone set in gold plated or sterling silver chain. For the bling lovers but with even smaller budget, these pieces from Forever21 are precisely adorable. We have some suggestions for those with no love for the bling – watch out for the next post.